Owner clinic Marzena Dubas – trycholog MD MEDMIX. 2nd degree trichologist – analyst, diagnostician, cosmetologist, specialist in medical pigmentation. Economist, manager. Marzena Dubas graduated from the Medical College at the Faculty of Physiotherapy and Cosmetic Studies. In the meantime, she graduated from the University of Economics at the Faculty of Economics and Management. From the young age, he is interested in medicine and related sciences. In 2008, she moved to Bielsko-Biała, where she opened the Medical Institute and started cooperation with specialists in the field of medicine and aesthetic surgery. Currently, the main interest of Marzena Dubas focuses on problems related to hair, such as treatment of hair loss, baldness, dandruff, seborrhea, as well as surgical and non-surgical methods of treatment of hair problems – hair transplantation and hair mirkopigmentation . For this purpose, she graduated under the auspices of the Kolasiński Clinic HAIR CLINIC POZNAŃ “Studium Tricology Clinical Education “obtaining the rights of an Analyst and Diagnostic Trichology . Marzena Dubas underwent training at the International Academy of Hair micropigmentation in Israel and obtained a license to perform follicular hair using microsimulation. Marzena Dubas also completed training at the International School of Permanent Makeup. In addition to the obligations related to the treatments, Marzena Dubas manages the cabinet. He deals with management and marketing matters. He cares about the image of the clinic on the Internet and in the media. He takes care of administrative matters and cares for contacts with patients. She constantly improves her practical skills and theoretical knowledge in the reproductive surgery of hair as well as body and hair medicine by participating in conferences, trainings and practical workshops . In her free time, she is passionate about sport and active recreation. The favorite sports are tennis and skiing. Dr n. Med. 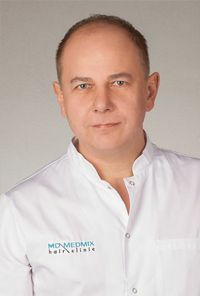 Michał Paczkowski is a graduate of the Medical Faculty of the Pomeranian Medical Academy, which he graduated in 1995 with the title of medical doctor. After completing the one-year postgraduate internship he completed clinical internships as part of the medical specialization in Surgery, and in 2000 he passed a specialization examination in General Surgery. Within the current interests of dr Michal Paczkowski, there is hair transplantation and scientific development of healing methods in cases of treatment of baldness and hair loss. Dr n. Med. Michał Paczkowski performed treatments and underwent a thorough training at the foreign clinic of the world-renowned surgeon Dr. Akaki Tsilosani and obtained a certificate entitling him to perform hair restoration surgery procedures. The scope of treatments carried out by dr Michał Paczkowski includes hair transplants using the FUE, FUT and BHT methods. Due to many years of experience in surgery and transplantation also performs abiegi difficult reconstruction in the field of hair transplantation in the vicinity of scars after accidents, burns, pogryzieniach by animals in both children and adults. Dr n. Med. M. Paczkowski also performs treatments for hair loss, in which he uses many years of knowledge in the field of obtaining stem cells from the blood. It is with this department of medicine, ie hair reconstructive surgery and hair medicine, that it binds its future and, in this area, wants to improve and develop its skills, deepen knowledge and pursue as a doctor. Commitment to work, extensive experience in the work of the surgeon combined with scientific work and the relentless desire to expand their knowledge are the main features of the doctor. 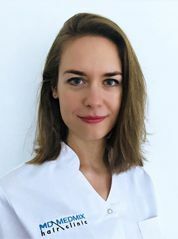 MD Natalia Nowara – Lauritano – graduated from the Faculty of Medicine of the Silesian Medical University in Zabrze, which she graduated in 2014, obtaining the title of medical doctor. He is currently in the course of specialization in General Surgery. Doctor Natalia Nowara- Lauritano also completed an internship at the Department of General Surgery in Italy. In 2016, she completed post-graduate studies at the Higher Medical School in Katowice in the field of Aesthetic Medicine. The interest of doctor Natalia Nowary- Lauritano also includes hair restoration surgery, as a field in which she combines knowledge in the field of surgery and aesthetic medicine. It constantly complements its knowledge through active participation in conferences and certified trainings in hair restoration surgery, general surgery and aesthetic medicine. In everyday work, he values ​​the effectiveness and safety of treatments, which harmonize with aesthetics and natural appearance. Bow. Med. Justyna Wykręt – specialist dermatologist and venereologist, member of the Polish Dermatological Society. She studied at the Pomeranian Medical University in Szczecin. 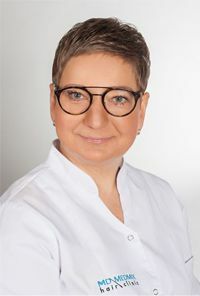 In 2012-2017 she worked at the Dermatological Ward in Cieszyn, where she gained experience in the treatment of dermatological, venereological and infectious diseases, and at the Anti-aging Institute in Bielsko-Biała, she increased her knowledge and skills with treatments in the field of aesthetic medicine and laser therapy. In his work he deals with the treatment of dermatological diseases of children and adults. Her hair is also interested in her hair. He deepens his knowledge and skills on numerous courses and trainings.